Keeping a bird as a pet is an exciting challenge, especially if you never adopt one before. However, once you successfully tame one such as train cockatiel to sing, the result is rewarding for you. Selecting the suitable bird for you will determine your compatibility with your beloved bird. Cockatiel is the smaller version of parrot. It is docile, sociable, and gentler than its bigger cousin parrot. This bird can also produce nice voice in which you can train cockatiel to sing. You can also train your cockatiel to get closer to you. Here is how to train cockatiel to fly to you. For the beginning step of encouraging your cockatiel to fly near you is by offer some food on your side. However, if you directly put small amount of food on your shoulder, you may get your skin pecked by your cockatiel. Thus, instead of directly putting food, offer it with your hand in a sizable amount of food. Direct your bird with hand that holds food to your shoulder. Slowly, your cockatiel will follow the direction and perch on your shoulder. Make sure to really give it the food after it successfully land on you. Another way on how to train a cockatiel to fly to you; is by saying your cockatiel’ name repeatedly to come to you. Once it gets familiar and actually acknowledge the name you give to it, it will react to anyone who calls it. By using name, you can use this way to teach your cockatiel to fly to you. First, call out your cockatiel using its name in a gentle tone. Do not snap or use fierce tone or you will only scare your bird. Call its name many times until it makes way to get closer to you. Make sure to repeat it several time until your effort succeed. When you trained your cockatiel to follow your command, you can start giving command as if asking for high-five by extending your palm. Gently move your palm up and down to coax your cockatiel. 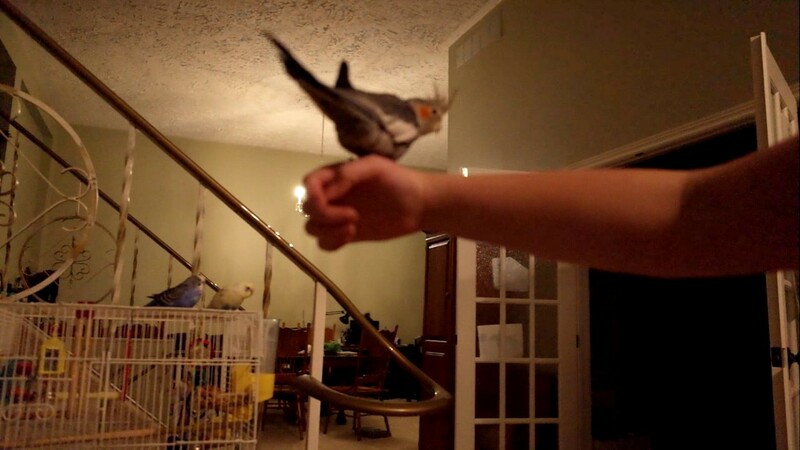 Hence, your cockatiel will start to follow your hand’s movement. It will give the impression that you are inviting the bird to be with you. You can also combine this way by calling out your bird’s name. Note that if you are pretty new with the bird, it may not immediately follow your movement. Always keep yourself patient whenever you deal with it. Cockatiel is not always in the mood to fly. There are certain times when a cockatiel is likely tend to fly off and wander actively. One of the best times for your cockatiel to fly is when before feeding time. Whenever a cockatiel is hungry, it will instinctively try to search food by flying around. This is the ideal time for you to offer food to your bird in a set distance. Thus, if you want to make your bird fly, set a distance about three to ten meters, give out your palm that has food on it in the direction where your bird will perch on you and see the food on your palm. Some cockatiels need more time to adjust itself and trust the owner, thus let itself fly to you. Therefore, you can learn how to train a cockatiel to fly to you by gradually change the distance where you stand. For the first, go with short distance to make your bird getting accustomed. After you coax the bird and it successfully fly to short distance, try to a farther distance for the next attempt. By doing so, you will help your cockatiel to fly in a slow pace instead of a forced one. It is best to let your cockatiel naturally adjust to your training instead of just getting the theory out of textbook. Reward and appreciation is important to keep the mood of your bird. Moreover, by giving praise every time your cockatiel succeeded on flying by saying “good job” or “well done” with appreciative tone. Even though bird is not like human, it does have some sort of emotion that can register appreciation. Therefore, if cockatiels see their masters keep praising them on an action, the birds are likely to repeat the action to do it over and over in order to gain praise and acknowledgment by their masters. However, only praise a cockatiel for positive behavior since they tend to think praise as approval for everything including when they misbehave. Also give reward like snack or toy as another way to show appreciation. If you do not treat them well, you may see some disadvantages of keeping cockatiel as a pet. You cannot expect your bird to always follow your command in a short period of time. Each of cockatiel has its own pace when learning things and some of them may also work best if you are keeping cockatiels in pairs. Thus, if you are not committed on how to train a cockatiel to fly to you, you are likely not going to receive satisfactory result. Hence, in order for your training to run successfully, be more persistent with it. Keep repeating the method over and over until your cockatiel finally is able to fly to you. Dedicate a time for like 20 minutes a day to train your cockatiel. While training a cockatiel need you to invest a good deal of time, the result is always worth it. You will receive a more interesting result and see advantages of keeping cockatiel as a pet, especially since cockatiel has better communication skill than other birds. This species also able to create close attachment to their masters and you will feel much rewarded of having them around. That is all about how to train a cockatiel to fly to you. Make sure to adjust every step to your bird’s space and do not force it way too hard. Be gentle and stern at the same time is all you need. Want to adopt other birds? Let’s learn a few things about cockatoo.